Zendensino celebrated their successful dissemination event. Come and see the pictures ! The Survey of schools: ICT in Education (Digital Agenda for Europe) outline how the ICT provision and use in European schools is improving but several obstacles remain. Firstly, teachers still believe that insufficient ICT equipment is the biggest obstacle to ICT use in many countries. Secondly, whilst teachers are using ICT for preparing classes, ICT use in the classroom for learning is infrequent. Teacher training in ICT is rarely compulsory and most teachers devote spare time to private study. Thirdly, students and teachers have the highest use of ICT and ICT learning-based activities when schools combine policies on ICT integration in teaching and learning. However, most schools do not have such an overarching policy. Therefore it is not surprising that teachers generally believe that there is a need for radical change to take place for ICT to be fully exploited in teaching and learning. Despite the fact that having access and positive attitudes towards implementing ICT into their teaching and learning, teachers often find this difficult and require on-going support - not only technical but also pedagogical. The data also reveal how there are relevant differences in ICT integration in Education approach among European countries, for this reason European education community need room for debate good practices in the the field of ICT in teaching and management of education activity. For this reason and to harmonize schools and policy approach the project is carry out internationally. Throughout the planned activities the project want to enhance the key competences and skills on ICT and learning performance of young people attending schools, through promoting quality improvements, innovation excellence at the level of education, in particular through enhanced transnational cooperation between education and training providers and other stakeholders in the field of ICT integration in schools (teaching and management). Moreover the project intend to boost the emergence and raise awareness of a European lifelong learning area designed to complement policy reforms at national level and to support the modernization of education systems, in particular through enhanced dissemination of good practices and cooperation. Enhancing digital integration in learning, teaching, at various levels: supporting ICT-based teaching, as well as ICT-based assessment practices. In particular, supporting teachers, educational staff in acquiring or improving the use of ICT for learning and related digital competences. 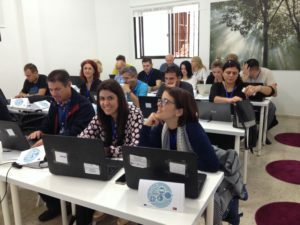 To gain this goal the programme fosters a long term cooperation between schools and other research and training organizations with a view on ICT integration in education establishing exchanges of good practices, for the creation of a dedicated network. To do so the programme proposes a set of activities for the establishing of a ICT Integration in School Distinction. Selected schools will participate in several activities such as studies of best practices, training workshops and dissemination events. DISCO is based on the use of a variety of equipment and tools provided by the partners involved in this project and will be available nationally and internationally to end-users. At a local level, schools will have better qualified and aware education staff. Regarding ICT in education it's expected that the products resulting from this project will be used not only by the end-users such as the entities participating in the project, teachers, non-profit organisations and local authorities working in the field of education and education provider directly through the website or by visiting the entities involved in the project, bearing in mind the objective of the project to help improve the quality of ICT education and ICT skills for young people.